At this busy time of stuffing Thanksgiving turkeys, holiday parties and Christmas shopping, life can get a little frantic. Why not take a few minutes with me now to stop and reflect on what you are truly thankful for? Professionally, I am thankful for having such a varied set of experiences during my career and for all of the SLPs and teachers who have given me such lovely feedback at my store. Personally, I am always thankful for having healthy children, and this year, for having my beautiful daughter-in-law join my family. Professionally, I’m thankful for working with amazing colleagues. I learn so much everyday and have a great support system. Personally , I’m thankful for my friends and family who are always there when I need them. I am beyond grateful for the opportunity I have to work with, encourage and impact families. The fact that I am paid for this work still blows my mind most days. Personally, I am thankful for the support I have received from family and friends to jump out on my own with my private practice. I am thankful for this profession because of the options that it gives us! I was able to take this year off to be with my newborn and two children. I am able to work part time or full time depending on what is best for my family at that time. Not many professions let you do that! I am also thankful for this profession because it has allowed me to help so many children and meet so many other amazing SLPs! I am thankful for all the doors this wonderful profession has opened for me. I would say I was a reluctant introvert in my younger years. I truly found my “jam” in learning how to help people with communication disorders. Along the way, I discovered more confidence in myself, and the ability to step out of my comfort zone to try new adventures. I am thankful I get to work with both children and adults who need help expressing themselves. It makes me treasure the gift of communication. I am thankful for the opportunity to learn something new each time I am faced with a new student or challenge. 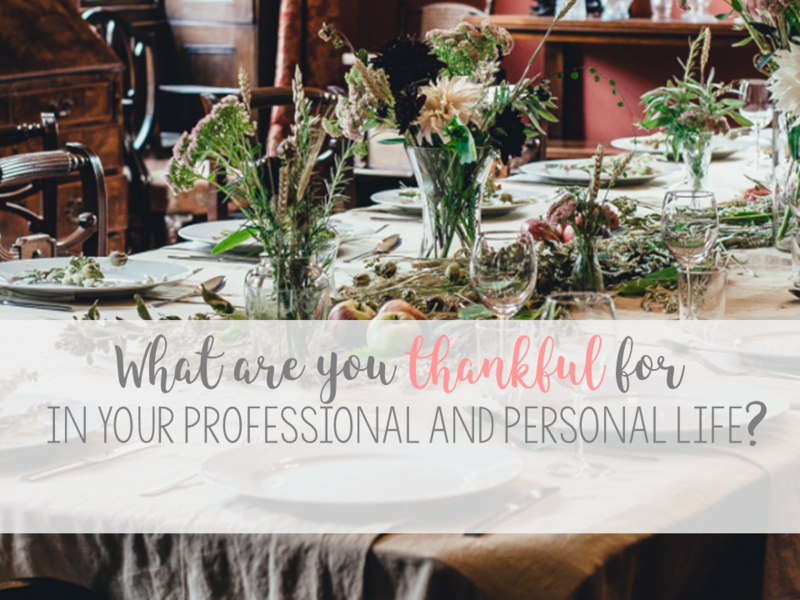 I am thankful this profession values my creativity, ability to problem-solve for my students and patients, and gives me the freedom to set the course of my therapy, armed with a solid knowledge base and understanding of my student’s individual needs. Finally, I am thankful for the many amazing students, families, SLPs, and teachers this profession has given me the privilege of meeting. They inspire me each and every day. I am thankful to have a career that I truly love and the opportunity to impact others lives by helping to open the door of communication. I am thankful that the same career provides me with so may possible avenues to pursue that I do not grow restless and can continue to grow professionally and help children, adults, and families. Personally, I am thankful for a supportive and loving husband and a beautiful, smart, funny, creative, sassy miracle (my daughter)! I am thankful for my husband being supportive of all my crazy endeavors. I am also thankful for the sweet, awesome kids that I get to work with. Personally, I am thankful for an amazing family that loves me and supports me and believes in me! They have been so patient with me as I’m trying to balance so many things and I couldn’t do anything without them! Professionally, I am thankful for the advancements in technology that allow us to know and do more than ever before! We literally have resources at the tip of our fingers that can help us to be out best! I am also grateful to be associated with smart, creative women that are working hard to make a difference! I’m so grateful for parents who work tirelessly to get the support their children need and are willing to learn a new set of skills so their child reaches their potential and their children who make me laugh. Every. Single. Day. I’m so appreciative my online friends and colleagues who’ve made me a much better clinician than I would have been on my own. I’m so thankful for my family, all of whom are taking on huge new challenges, rather fearlessly, and inspiring me to take more risks in my own career. I am thankful for my family (especially my 2 year old daughter), my friends, and having a job I love! Wine and coffee are bonus loves too! I am thankful for parents that believe in me and instilled the idea that all people are worthy of respect and dignity. I am thankful for my husband and children as they put up with all my shenanigans! Doesn’t that make you feel all warm and cozy inside? I LOVE being in the company of these engaging, smart, caring women! As for me, I’m grateful for you. I so appreciate you taking the time to read what I’m writing and listen to what I’m saying. I love interacting with you and sharing ideas. Our profession is so important. We play a pivotal role in the education of thousands of children and their families. That is such an honor and a privilege that we share. What about you? What’s on your gratitude list? I’d love to know…please share in the comments below. P.S. I’m also thankful for cute shoes, red wine, can’t-put-it-down novels, Instagram, Brad, my family and laughing out loud. I’m also honored to be in this group of creative, supportive SLPS who are now my friends! Happy Thanksgiving! I am thankful to work in a school district in which all of the SLPS are resourceful, supportive and friendly. We’re friends outside of our professional environment and is great to work with such talented group of SLPs who I can consider my friends. That is so great to hear Erin. I find SLPs to be some of the smartest, most caring people I know. Hey there I’m Anne Page. I help heart centered SLPs and educators put the fun in functional communication.